Level a "main" chef to a high level (140+), so you can more easily cook exquisite low-level food items and in general, cook slightly faster. Chef alt characters are required, especially if you can play on multiple devices at once. Farm ingredients that you will need for recipes. Store-bought recipes (referred to as “special” in this guide) can be purchased from the tavern NPC Delia Dermont and quest recipes (referred to as “normal” in this guide) can be earned by questing through the tavern NPC Gideon Ramsford. Ultra-rare recipes can also be farmed from cooking bosses located in Gelebron's tower. A.	Crops: Oats, wheat, lentils, barley. B.	Meats: Used for special recipes, which give double the experience as quest recipes per cooked meal. Mostly found in Lir's Reach, though some are found in Stonevale farm. Try to gather a few hundred of each at a time. This is time-consuming, but faster than cooking quest recipes and is potentially cheaper. 1. Raw rabbit meat: from rabbits scattered throughout Lir's Reach. 2. Raw mutton: from sheep, found at Highshore Village. 3. Raw pork: from pigs, found at Highshore Village and Stonevale Farm. 4. Raw beef: from cows, found at Highshore Village and at the Dairy Farm in Lir's. Can also be found at Stonevale Farm. 5. Raw venison: from deer, located around the Temple of Belenus and scattered throughout Lir's. Can also farm from Otherworld stags. 6. Raw boar meat: from boars, found near Goretusk in Stonevale. 7. Fish products: from fishing spots. A. For the first ~40 levels, there aren't many recipe options, cook broth and bread for now. You can eventually use exquisite bread and normal broth for cooking other special foods. B. Do bulk orders with meals cooked on alts or keep them to bulk order on other alt chef characters you plan to make (recommended). By the time you get to your fourth of fifth cooking alt, it is incredibly repetitive and boring so save them to do bulk orders. D.	At level 50, you can start earning Bronze Marks of Dagda from quest cooking caches. 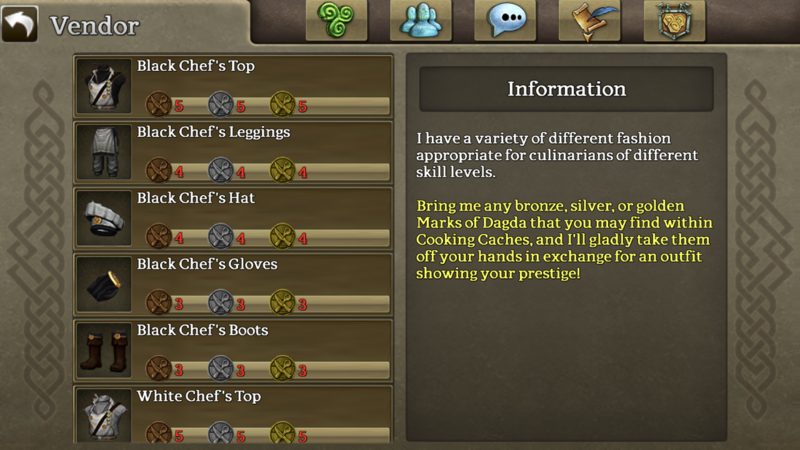 Use your "main" chef to cook the exquisite items needed for the cache quests as it is much easier. Your alt toons cannot cook exquisite items efficiently. Cook exquisite items in bulk to use for dailies on chef alts, especially if you don’t wish to level them through manual cooking. E.	Make sure to complete the daily quest. F.	At level 80, you start receiving Journeyman caches from daily quests, which can contain bronze marks as well as silver. Continue to cook on your main chef to level your Mastery ability, so you can cook exquisite meals more frequently. G.	The drop rates for bronze tokens aren’t extremely low so if you are content with the pink or orange chef fashion set or if you just want to farm bronze tokens, feel free to leave chef characters at 80 and level them from dailies alone. It took me roughly 20 days to get to level 90 from 80 with only dailies. H.	Keep cooking special foods. If you have run out of ingredients, you can settle for normal foods. Also the ingredients that you need to buy from the fishing vendor is expensive, so it’s recommended to start cooking normal food from here and save the food to use for bulk order on more alts. I. At level 110, you start receiving expert caches. Silver marks seem to drop more often from these caches than from Journeyman’s caches, though this doesn’t seem to be the case for bronze marks. J. At level 140, you start receiving gold marks from Master’s caches. At these upper levels, cooking becomes more expensive and exquisite items are harder to cook, even with a high mastery level. •	Cook exquisite foods in bulk if you are bored and don’t plan to cook in the next few days/weeks to use towards cooking dailies. •	Level mastery on main chef by cooking low level items like gruel and flatbread. Additionally, level mastery on foods needed as ingredients for other foods. •	Sell special foods to players if you need gold. •	On Arawn, I paid 6-10k per 100 crops, which is rather expensive. You can probably find people willing to farm the crops if you are short on time or lazy; it’s a good way for noobs to earn a bit of gold. Personally, it takes about 25 minutes to farm 350-400 crops. •	I leveled 5 chef alts at the same pace. It is easier to organise exquisite foods this way. •	Cooking mastery on all my chef alts are below 15; don’t expect to be able to cook exquisite on alt. On the other hand, my main’s mastery is above 1500. •	Cooking can be expensive if you are in a rush. Overall, it’s cost me around 3 million gold. This includes wisdom and exp lixes, crops and extracts. •	Not enough data was collected for apprentice and expert caches. The apprentice cache has a total sample size of 15 and cannot accurately reflect the true rate of the bronze tokens. Calculated drop rates seem believable however, for expert caches. The contents of around 60 quest caches were unrecorded. Some of the data is out of order, mainly towards the end, since I’d transferred all caches to one character and opened them all. There were some unlucky/lucky streaks in loot. •	Farming tokens takes a lot of effort, especially since caches have low item drop rate. But once your alts are levelled, you can keep farming with ease. •	Does the cooking level of a character affect the drop rates if they get the same cache (Eg. a level 90 and 100 get the same cache, do they have the same loot chances? Does opening all caches on one character vs. opening on different characters affect drop rates? •	Was cooking worth it? Depends if you have the time and money for it. It was worth it for me personally; I made the first 3 cooking sets (pink, orange, and blue) on Arawn (I think). •	Looking forward to feedback. Has anyone else done this? What were your results? Approximate drop rates? Hope people include their own advice as well. If anything I said was incorrect or inaccurate, feel free to correct me. If anyone else has a different take on how to analyse data, please share. I probably won’t be collecting any more data from this point because I’m busy. Feel free to take my data and compile it with yours. My first cache at level 20 I recieved a silver mark. Oh rip you can get dailies at level 20 my bad. Thanks for info on token. If anyone else has data on the beginner and apprentice caches, can you please share. Can you get gold from these caches? Joewin wrote: Oh rip you can get dailies at level 20 my bad. Thanks for info on token. If anyone else has data on the beginner and apprentice caches, can you please share. Can you get gold from these caches? My first gold was from a beginner or apprentice cache while I was still low level in cooking, so it is possible. Wonderful information! Thank you for taking the time to put this together, those marks are defiantly hard to come by. Those drop rate calculations...though make me cry. I slogged through with two alts but only one getting master’s caches as well as my main. The goal was white cooking fashion which I believe required 21 gold marks. I begged, borrowed and bought many of them. When I first achieved level 180 cooking, I had enough for two hats (loaned marks to another chef to get hat too). If the approximate 2% drop rate is correct, then the expectation would be opening 1000 caches to get the required marks. Three years on one character or six months on six toons. The dash is nice with flames and all. I wear it all the time. Only one on Crom. How long did it take you to get white fash with your six cooking toons? And what level were all of them? 80?